I am so thankful that August is over. I just want to it to be fall and cold and to wear sweaters. School's been going. I don't enjoy school at the moment, but I am not fully stressed yet. I just wish I could already be over with the dreaded junior year. Well here are my favorites! 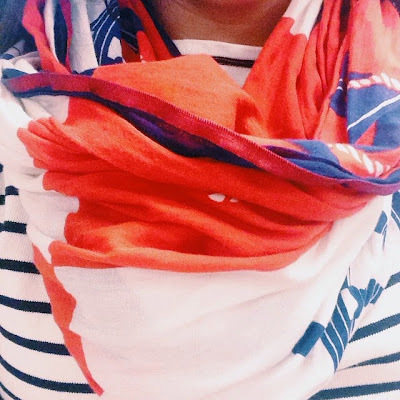 Striped Shirt & J.Crew scarf | This is a very specific outfit, but I've worn it twice this month, so I felt like I had to talk about it. I am obsessed with everything about this outfit specifically pattern mixing which coincidentally might also be an upcoming post. Shake It Off | Hello, new pump up song. This is definitely different than anything TaySwizzle's done before, but I love it. I listen to it every single day when I am getting ready for school. Guardians of the Galaxy | Oh my gosh, y'all this movie is so funny. It's the perfect mix of superhero movie and hilarious comedy. I love superhero movies, but sometimes I find them too intense, but since this one is so funny, it kinda helps contrast the action. Kind of a short list but I've been so busy that's hard to find favorites!